Being a millennial entrepreneur comes with it’s fair share of emotional ups and downs. Some days your energy is high. Your creativity is on fire. Other days? You find yourself in a motivational slump, wondering where that inspiration and focus disappeared to. Recently I had one of those frustrating “off days.” My mood was low, my brain was foggy, and my inner critic was seriously acting up. Maybe you can relate. We’ve all been there at one time or another. In the interest of having more honest conversations about work-life balance, happiness, and what it’s really like to be part of the side-hustle generation, I want to share how I lift myself out of a rut and rebound from a bad day. When I’m feeling overwhelmed or uninspired, I first shift something in my surroundings. There’s science behind this seemingly simplistic approach: It’s been shown that a change of environment stimulates creativity. Luckily in New York City there’s no shortage of quirky, wifi-enabled places to work like the David Rubenstein Atrium at Lincoln Center, a spot that a friend recently turned me on to. When I step away from distractions and give myself space to think, my best work comes out. The mind is like a muscle: it requires careful maintenance or it’ll eventually be pushed beyond its limit sending you into burnout territory. Focused thinking free from distractions and social media–what Georgetown University professor and author Cal Newport calls “deep work“– is essential on days when I’m feeling scattered. Working from a hidden haven like this secret garden in Central Park allows me to concentrate for an extended period of time. A bad day tends to cast a cloud over everything and trigger negative feelings that make us see situations more pessimistically. When in the thick of a funk, I remind myself that while I may have bad moments, it’s not a bad life . 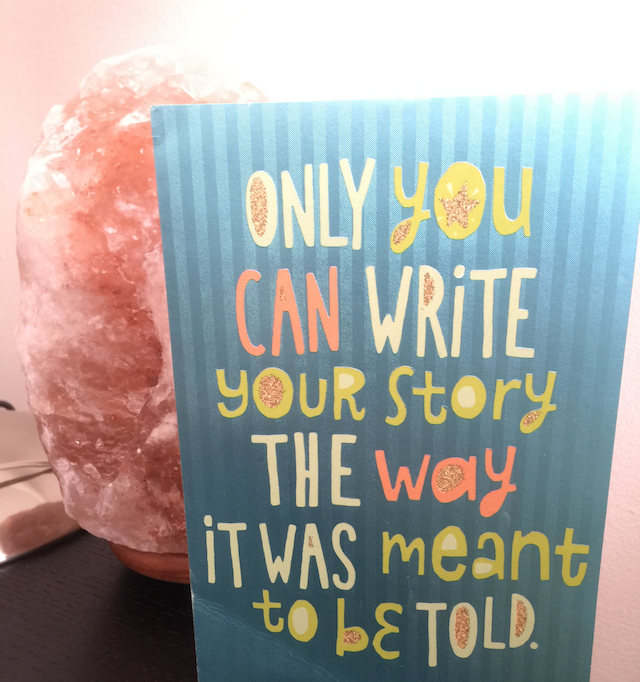 A high point of my day was receiving this thoughtful card from my Mom. It was just what I needed to shift my attitude. What also keeps me on track when a bad day threatens to take me off course is trusting the systems and structures I’ve put in place for the way I work. I’m a big fan of morning rituals and equally rely on evening routines, including zeroing my inbox and jotting down my number one priority to accomplish the next day. It ensures I hit the ground running tomorrow and helps me leave that funk far behind.